BJP cancels all political events of PM Narendra Modi and party chief Amit Shah. Congress president Rahul Gandhi cancels meeting with G20 nations' representatives. 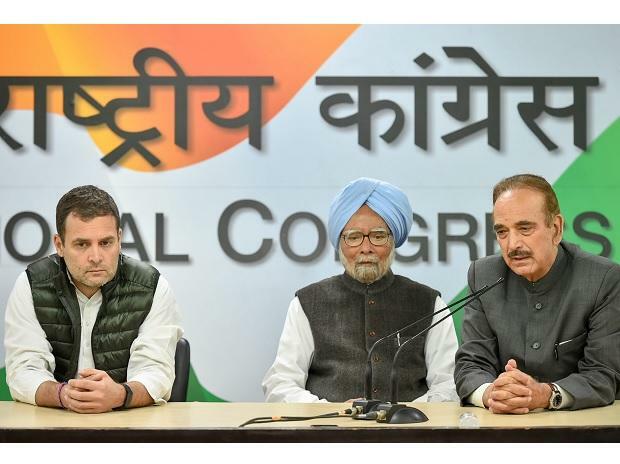 Most Opposition parties, including the Congress, on Friday said they would support the government in all actions in the wake of the terror attack in Pulwama. While the Sangh Parivar ratcheted heat on the government, demanding retribution against Pakistan for allegedly sheltering terror outfits, Prime Minister (PM) Narendra Modi’s government called for an all-party meeting on Saturday. Other Opposition leaders—Nationalist Congress Party (NCP) chief Sharad Pawar and Bahujan Samaj Party president Mayawati—reminded the PM how he had criticised the previous United Progressive Alliance government for not taking action against Pakistan, and asked Modi to walk the talk. The Bharatiya Janata Party(BJP) cancelled all political events of the PM and its chief Amit Shah. The Congress followed suit; its president, Rahul Gandhi did not meet G20 nations’ representatives. “This is a terrible tragedy… the aim of terrorism is to divide this country and we are not going to be divided,” said Rahul Gandhi at a press conference. He was accompanied by former PM Manmohan Singh and senior leaders A K Antony and Ghulam Nabi Azad. The Congress chief said his party would not enter any conversation and would stand with the family of the 40 slain soldiers. The Vishva Hindu Parishad (VHP) said terrorist bases in Pakistan must be destroyed. “Efforts to declare Jaish-e-Mohammad a terrorist organisation have been vetoed at the UN by China. The nexus must be broken,” said VHP international working president Alok Kumar. NCP’s Pawar said the Pulwama incident was attack on the nation. “He (Modi) used to say the Manmohan Singh government did not have ability to teach a lesson (to Pakistan). He also used to remark that only those with a 56-inch chest could administer a tough lesson to Pakistan,” Pawar said. “But everyone has seen what has happened now. Today, I will not repeat the same demand which he (Modi) had made (at that time),” Pawar said, adding that Modi’s image has been hit.